Image caption Buildings at the centre were cordoned off by police today. 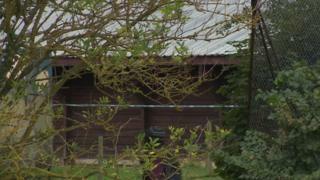 A four-year-old boy has drowned while on holiday at an activity centre in Devon. The boy, from Weymouth, was found in a swimming pool at Knapp House Activity Centre near Bideford on Monday. Devon Narcotics Anonymous (DNA), which hosted a week-long event for members and their families, confirmed the boy was the child of one of its members. The centre said pool use was self-supervised, but DNA said swimming was supervised by centre lifeguards. More on the death and the latest Devon and Cornwall news. The boy had been on holiday in the area with his family, police said. He was reported missing and found in a swimming pool following an "extensive search" assisted by a helicopter. The boy was taken to North Devon District Hospital where he was pronounced dead. A statement on behalf of Knapp House Limited said: "The group had the use of the pool on a self-supervised basis for recreational use - it was not part of the planned activity program that we provide. "We are fully committed to understand exactly how this could have happened and will continue to liaise with the emergency services, the Health and Safety Executive and Narcotics Anonymous to establish this." The DNA summer holiday campout committee, which organised the event, said: "One of the activities we organize with Knapp House is the supervised use of their swimming pool with their trained lifeguards. "Very tragically, something has gone horrifically wrong, and a young child of one of our members drowned in the pool. "We find all attempt at expressing our sorrow and concern for the parents and siblings of this child inadequate, but as is normal in our fellowship, they will have plenty of support as they face their tragedy." Devon and Cornwall Police said the death was being treated as unexplained and investigations continue.